[2012 Sept] Leeds midwife wins a battle to change birth guidelines She said there were many health issues linked to immediate cord clamping. Now, national body the Royal College of Midwives (RCM) has said its latest guidelines will advise that delaying umbilical cord clamping is best practice. 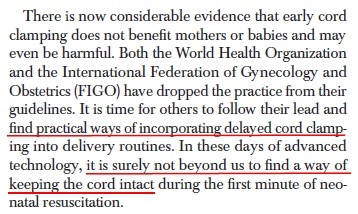 [2010 Dec] Why do Obstetricians Still Rush to Clamp the Cord? By Dr. Mercola Cord clamping has become the accepted norm so much so that delayed clamping is generally considered a new or unproved intervention. Real reasons for early cord clamping? 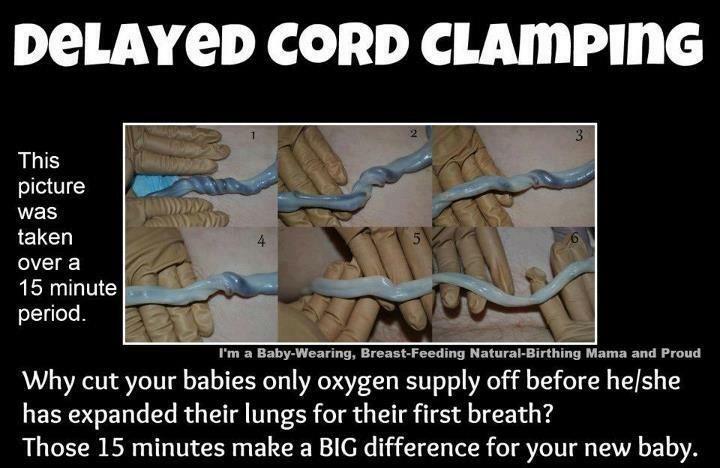 Delayed Cord Clamping by Hilary Butler. Cerebral Palsy and Cord Blood Gases by Dr. George Malcolm Morley - A Letter to the Editor of the British Medical Journal. Twenty-One Frequently Asked Questions/Answers Concerning Birthing Procedures and Vaccines by D. Young and G. S. Goldman 30 cases of birth injuries (e.g., skull fractures, facial nerve palsies, brachial nerve injuries, and severe cephalohematomas) in hospitals; no birth injuries at home.